[meta]marketer > 2014 > January > 7 > Is Peter Gabriel secretly a Tao Master of Marketing? Is Peter Gabriel secretly a Tao Master of Marketing? 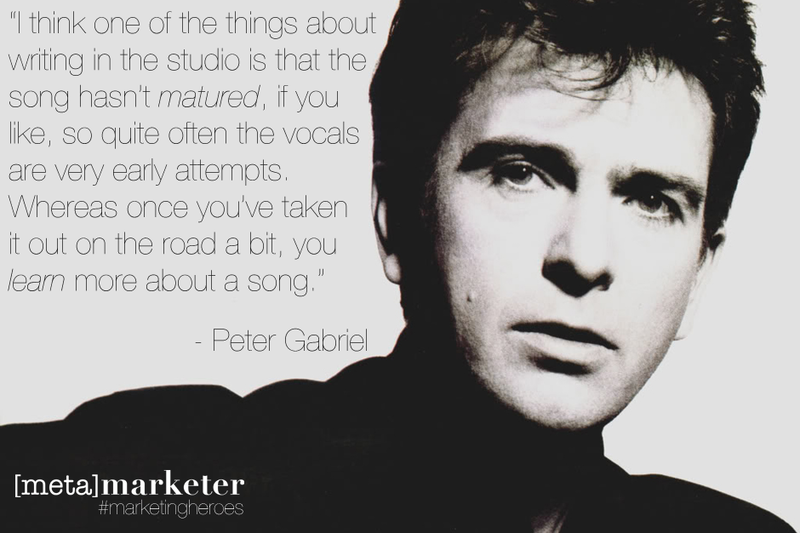 Peter Gabriel is a marketing hero of ours. If you’re too young to have heard of him, his song is the one that plays when Lloyd Dobler holds the boom-box over his head in that iconic scene in the movie Say Anything. He also used to be the lead singer for Genesis (we’re talking pre-Phil Collins days, when Phil was basically just the drummer). In 1976, Gabriel left the band for a variety of reasons. In 1977, he released a self-titled solo-album featuring the song “Solsbury Hill” which is widely interpreted as a personal reflection on his departure from the band. It was a pretty solid hit when it came out, but instead of just sticking to what worked initially, Gabriel is constantly testing and retesting the song– letting it evolve with every iteration– like a microcosm of marketing effectiveness. You might even say that Peter Gabriel’s entire career could be a read as a roadmap of scalability and sophistication. It’s like he’s able to hold onto what’s good, but still be free enough to let it go so that it can grow into something better, and even into something a little different. And it’s all intentional. If there was a “Tao of Marketing Effectiveness” this would be in it. Peter Gabriel’s latest album drops today, “Scratch My Back… And I’ll Scratch Yours.” It’s a two-disc collection of covers: songs by other artists that Gabriel covered and songs of his that other artists covered, including a cover of “Solsbury Hill” by the late Lou Reed. We expect it’ll be worth a listen. We also expect to be inspired to iterate and improve on what already works, even if it works well. This entry was posted in mostly for fun and tagged marketing effectiveness, marketing hero, peter gabriel. Bookmark the permalink. Follow any comments here with the RSS feed for this post. Both comments and trackbacks are currently closed.